Set in New Delhi, India, and New Orleans, Louisiana, with visits to New York City, Louisiana Catch is modern contemporary women’s fiction at its best. Told in a fast-paced, almost memoir-style of writing, the book sweeps readers away from location to location, continent to continent, not unlike its characters. When Ahana’s mother dies unexpectedly, she begins online therapy as a way of coping. Online, she meets Jay Dubois, an American in Ohio. At the same time she accepts a project leading a women’s conference in New Orleans. Part of her job is working with social media consultant Rohan Brady, part Indian, part Irish. Therein begin two very different, complicated relationships, mostly online, mostly full of texts and emails and chat messages. Vikram has painted bold characters with multifaceted, over the top personalities. Although the book is often guilty of telling versus showing, the action-packed pages make this a completely forgivable offense. Ahana is neurotic, stressed out, full of grief from her mother’s death and fear from her husband’s abuse. She trusts nobody and thinks the worst of everyone. Her passion for women’s rights is clearly the focus of the story. 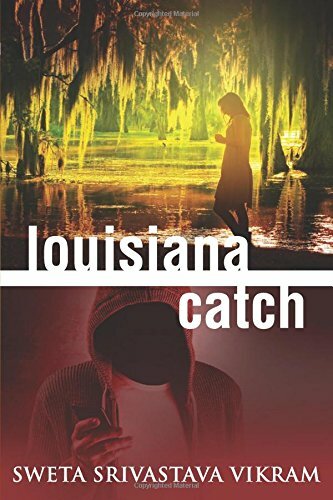 While a thriller-type women’s fiction on the outside, Louisiana Catch is in reality a commentary on social and technological issues that plague modern society. Ahana develops online relationships with people such as Jay and Rohan, both of whom she thinks she knows but is mistaken. The story expresses how current social media technology allows online and actual personas to blur and be confused, how what we see online is often inaccurate and can lull us into a false sense of security. Equally front and center is the topic of sexual and physical abuse suffered by Indian women. It is the major theme of the book, since not only is Ahana a victim, but a major plot point includes her organizing a women’s conference titled No Excuses! Through the story’s progression, readers witness a sort of social and personal growth of Ahana, who transforms from a protected woman to one who suffers through the harsh realities of life. At the same time the ugly, dangerous nature of the online community and social media is laid bare for readers to think about. Vikram is no stranger to women’s issues. She’s a bestselling author of 11 books— Louisiana Catch being her American debut—as well as a certified yoga and Ayurveda counselor. This book will be a welcome addition to modern-day discussions of women’s rights, multiculturalism, and online technologies.